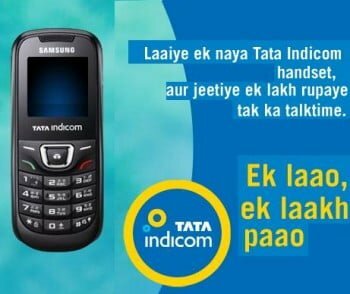 Tata Indicom, the Pan India CDMA mobile service provider today announced the launch of Handset Upgrade Offer for prepaid subscribers in Andhra Pradesh telecom circle. Under the offer, the benefits include free talk time up to Rs 1 lakh on the purchase of any CDMA handset from any outlets. To avail the offer, The Tata Indicom subscriber will have to SMS “OFFER” to 12524 from his handset, within 7 days of purchase, to avail the free talk time. The assured talk time is Rs 50 and the customer can get talk time upto Rs 1 lakh, which will be credited to the user’s account within a period of 7 days. This offer is valid till 19th December 2010 applicable to all new CDMA handsets, including Tata Indicom handsets, available in the market. Good going offer.please launched this offer in all pan india circle.Best of luck. Guys, sorry I can’t attach any document in TT post do describe above plans in a clear manner. I will request all to kindly visit the given link for more details.